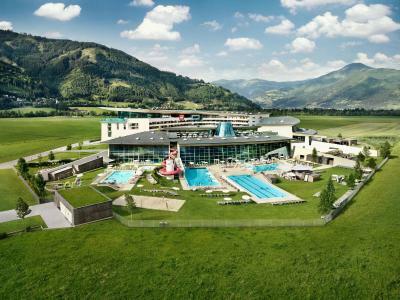 Lock in a great price for Tauern Spa Hotel & Therme – rated 8.9 by recent guests! Great breakfast and dinner, lots of variety, and very friendly staff! Hotel spa is awesome with a nice view from the outdoor infinity pool. 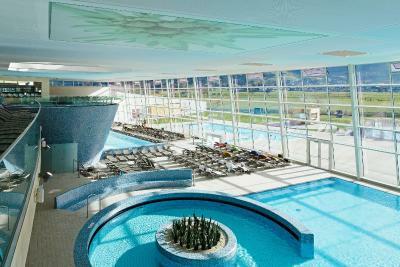 The big spa has something for everyone - pools, saunas, etc. There is even a bar outside so you can drink a cocktail in a hot pool! Slopes are a few minutes away by car. Good location, breakfast, staff, everything, they are nice. 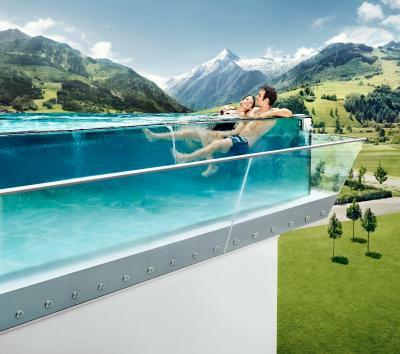 All the Pools with the view. The Rooms. Breakfast. Very nice rooms. Wonderful cooking (high cuisine dinners, partially served, partially high-quality buffer, buffet breakfasts with many kinds of fresh bread and quality ingredients). Staff professional, attentive, yet friendly. Garage parking for guests, with EV charging. The place is dreamy, the views are breathtaking from the bedroom and every corner of the hotel, breakfast was delicious, the hotel has 9 pools altogether, infinity pool was the best out there with scenic beauty. One entire floor for spa and to pamper yourself. Car park is free, we drove all the way from Innsbruck and it was totally worth it, the journey and stay was amazing. If you have a car then half board is not needed, drive a kilometre or 2 and reach Kaprun, eat at any cafe or restaurant, we did that and found some amazing restaurants there. We stayed for 2 nights, it was perfect. Will definitely come back again! Best holiday spot in Europe. 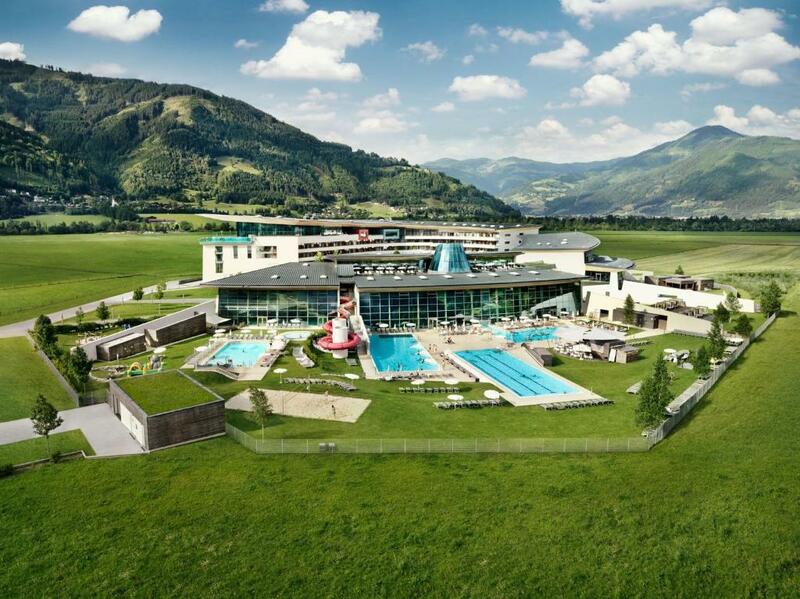 Tauern Spa Hotel & Therme This rating is a reflection of how the property compares to the industry standard when it comes to price, facilities and services available. It's based on a self-evaluation by the property. Use this rating to help choose your stay! 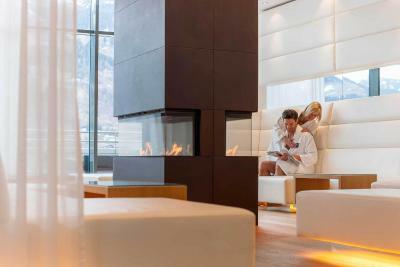 This 4-star superior hotel in Kaprun features 66 ft² of indoor and outdoor spa area and a glass-covered outdoor pool. Each room has a balcony with impressive mountain views and a free mini-bar, which is refilled daily with nonalcoholic beverages. The Kitzsteinhorn Glacier ski area is 3.1 mi away. Garage parking is possible for a surcharge. 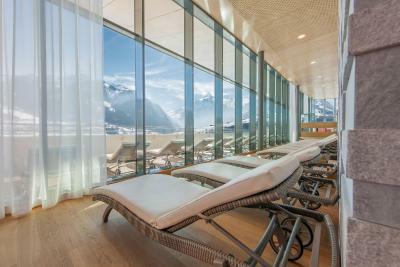 The spa area of the Tauern Spa Hotel & Therme includes 12 indoor and outdoor pools, 13 different saunas and steam baths, aqua gymnastics, and a relaxation lounge with a fireplace. Teas and fruit juices are provided free of charge. 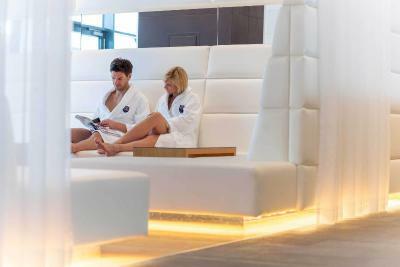 The property provides a direct indoor access from the hotel to the public spa area. A modern fitness room with panoramic mountain views and a wide range of massages, healing baths and beauty treatments are also available. The spa area and the fitness room can be used free of charge. A spa area especially for children is available on spot, which includes amenities such as a large outdoor pool, 2 water slides, a wading pond, a games room and a children's playground. Professional child care is provided for children over 3 years of age. 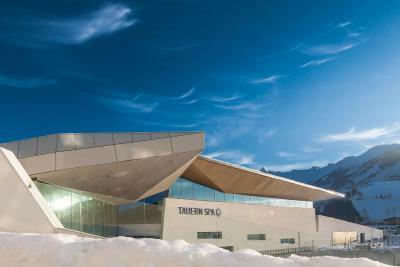 All rooms at the Tauern Spa Hotel & Therme offer satellite TV and have a bathroom with bathrobes and a hairdryer. 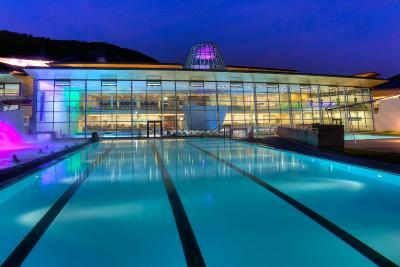 The Tauern Spa features 6 different restaurants, bars and cafés. 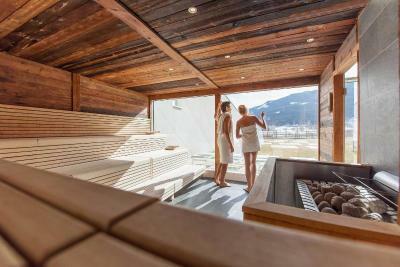 When would you like to stay at Tauern Spa Hotel & Therme? Room with a seating area, a mini-bar and satellite TV. 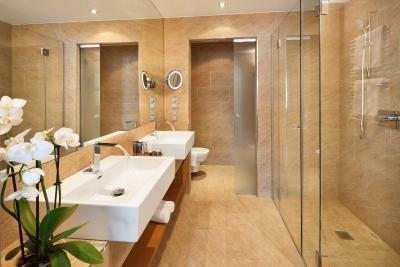 The room features a balcony and a modern bathroom with glass walls. Room with a separate living area and a walk-in closet. 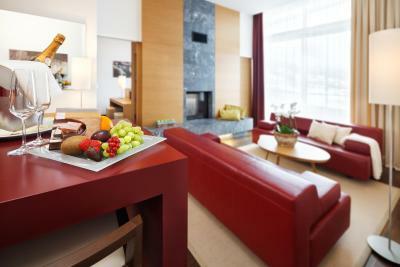 The room has a sitting area, a minibar and satellite TV. 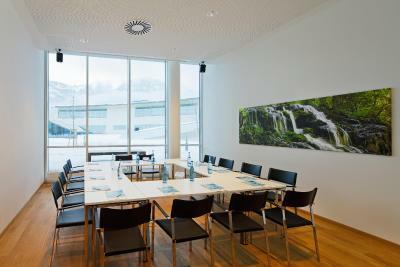 The room has a balcony with panoramic mountain views and a modern bathroom with glass walls and a double sink. 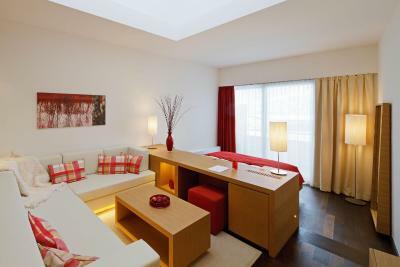 Room with a sitting area, a minibar and satellite TV. 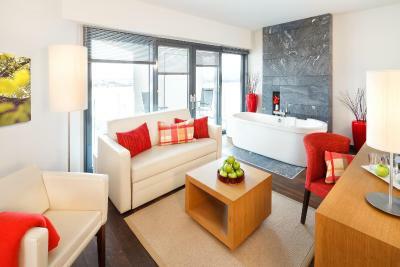 The room has a balcony and a modern bathroom with glass walls. 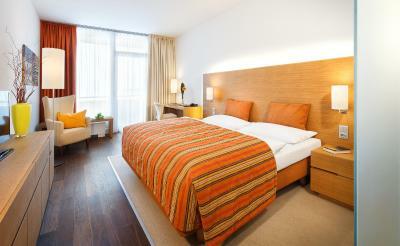 Guests can enjoy panoramic mountain views directly from the bed. 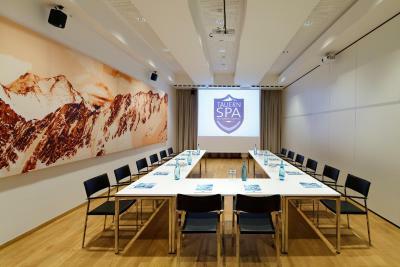 House Rules Tauern Spa Hotel & Therme takes special requests – add in the next step! 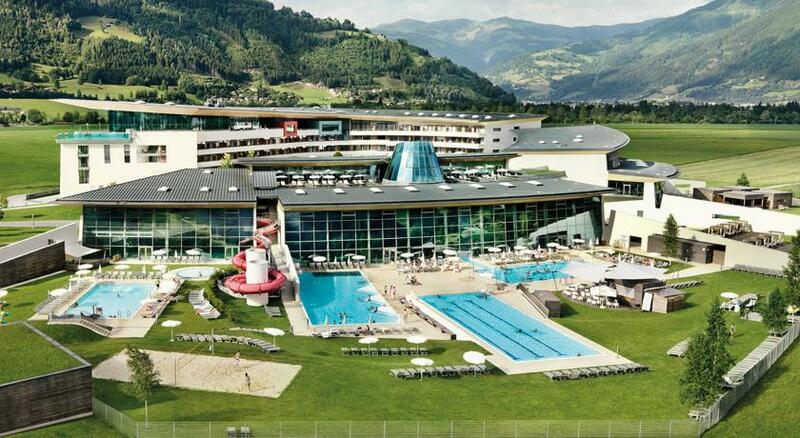 Tauern Spa Hotel &amp; Therme accepts these cards and reserves the right to temporarily hold an amount prior to arrival. 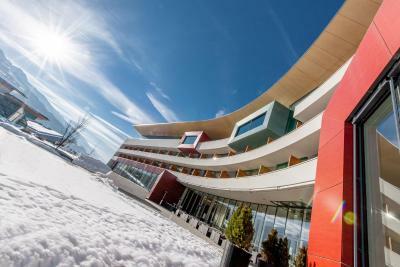 Tauern Spa Hotel & Therme accepts these cards and reserves the right to temporarily hold an amount prior to arrival. Please note that children under 15 years have no access to the saunas and the Panorama Spa. On the day of arrival, the wellness area and the sauna can be accessed from 09:00, while on the day of departure, they can be accessed until 11:00. If you are traveling with children, please inform the property in advance of their number and age. Contact details are stated in the booking confirmation. Please note that extra beds and baby cots are available for a surcharge. When booking 10 rooms or more, different policies and additional supplements may apply. The property will be undergoing renovations from Fri, Apr 05, 2019 until Wed, Jul 10, 2019. During this period, guests may experience some noise or light disturbances, and some hotel facilities and services may not be available. Please tell your guests in advance that there are some room imperfections, such as a view for example. In our case we had a dissapointing thing - there was a reconstruction under our window and two enormous cranes worked just in front of our room. Unfortunately, it extremely changed the view. dinner quite sophisticated but not tasty. personel good mainly in smiling, not very helpfull room with a view to a ... crane, very noisy works from 8.00 a.m. to 6 p.m.
We only booked bed & breakfast as we enjoy eating at local restaurants at night however this seemed to cause a problem at breakfast, every morning we went down to be told sit at the same table as you had dinner last night which we clearly hadn’t had, the staff seemed to struggle to find us a table every morning as all the tables have a families name on them, surely we are not the only people who book B&B !!!!! It took until our last morning (morning 8) for them to realise we only had breakfast. 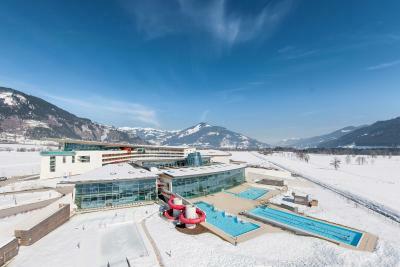 Everything was clean, staff were friendly, kids loved having the pools after our skiing. Food was excellent and everything you could ask for at breakfast. Point #1. We had a view to 2 huge cranes and construction. I would expect that administration lets me know in advance about such circumstances. Also normally such rooms are discounted, I came to see Alps, not crane. Point #2. The window from a room to bathroom is floor-to-ceiling, it has no marks on it, it is transparent. I was thinking it is not a window at all and stepped into it. And friends I came with did that too, it ended with a lump and a bruise on my friend's forehead. I don't know if it is even legal to do it, there should be some matte parts on a window so that one sees that it is a window, not an entrance. 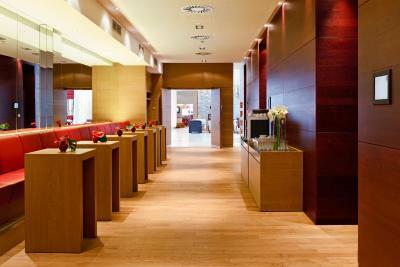 And the bad thing is that there was no immediate reaction from the hotel administration, which is outrageous for a hotel that claims to be 4 star. On checkout we were offered a prosecco bottle and 5% discount for our next stay. But it was too late to say sorry frankly speaking. Not sure if our "next stay" will happen. You can either go to public SPA area, or there's also a SPA zone for those who stay at a hotel only. And this Spa area is nice, not crowded, all you need in place - several different saunas, pool, towels, relax zones, teas and snacks. The food was great, massive breakfasts, I found all the things I like. Staff at the restaurant is polite and fast. The area itself is gorgeous, you are surrounded by mountains. One of the days there was a noisy repairing process close to our room which started from 8am. 2 days later at 4pm a guy was working with a tool on construction on the front of the room - this is a time when we come back from the slopes and silence is a must. We loved the food, SPA and the friendly staff. Nice parking with direct access to the ski storage. Both SPAs - public and private are great. Your refusal to sell a full size pills larger in the bar when you will sell a large wisebeer is frustrating. That you will sell a full size larger in the restaurant is totally bonkers. It just hacked us off. Small point I know. The bathtub in the room. Class walls in bathroom. We were 3 sharing the room so little privacy would have been nice, there are curtains but they do not cover all the way. 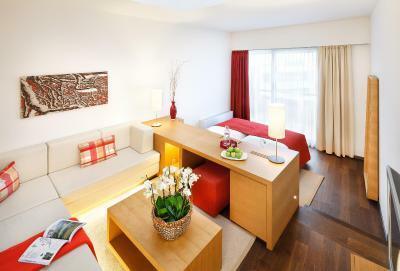 Nice beds, and every thing nice and clean. We do not like the menu served, we prefer a buffet offer. Even so, the food was excellent. 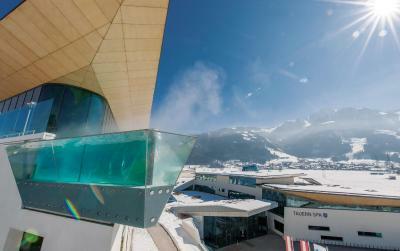 Fantastic place for relaxing, ski and wellness in ONE place.